(Nanowerk News) Scientists at the University of Adelaide have made a breakthrough that could change the world's thinking on what light is capable of. The researchers in the University's new Institute for Photonics & Advanced Sensing (IPAS) have discovered that light within optical fibers can be squeezed into much tighter spaces than was previously believed possible. Optical fibers usually act like pipes for light, with the light bouncing around inside the pipe. As you shrink down the size of the fiber, the light becomes more and more confined too, until you reach the ultimate limit – the point beyond which light cannot be squeezed any smaller. This ultimate point occurs when the strand of glass is just a few hundred nanometers in diameter, about one thousandth of the size of a human hair. If you go smaller than this, light begins to spread out again. 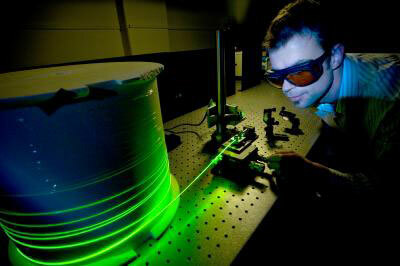 A researcher is testing an optical fiber system in the Institute for Photonics amp; Advanced Sensing, University of Adelaide. The Adelaide researchers have discovered they can now push beyond that limit by at least a factor of two. They can do this due to new breakthroughs in the theoretical understanding of how light behaves at the nanoscale, and thanks to the use of a new generation of nanoscale optical fibers being developed at the Institute. This discovery is expected to lead to more efficient tools for optical data processing in telecommunications networks and optical computing, as well as new light sources. IPAS Research Fellow Dr Shahraam Afshar has made this discovery ahead of today's launch of the new Institute for Photonics & Advanced Sensing. The Australian Government, South Australian Government, Defence Science & Technology Organisation (DSTO), Defence SA and the University of Adelaide have committed a combined total of more than $38 million to support the establishment of the new Institute. IPAS is a world leader in the science and application of light, developing unique lasers, optical fibers and sensors to measure various aspects of the world around us. A strong focus of the new Institute is in collaboration with other fields of research to find solutions to a range of problems. "By being able to use our optical fibers as sensors – rather than just using them as pipes to transmit light – we can develop tools that, for example, could easily detect the presence of a flu virus at an airport; could help IVF (in vitro fertilization) specialists to determine which egg should be chosen for fertilization; could gauge the safety of drinking water; or could alert maintenance crews to corrosion occurring in the structure of an aircraft," says Professor Tanya Monro, Federation Fellow at the University of Adelaide and Director of IPAS. Professor Monro says Dr Afshar's discovery is "a fundamental breakthrough in the science of light". Another IPAS researcher, Dr Yinlan Ruan, has recently created what is thought to be the world's smallest hole inside an optical fiber – just 25 nanometers in diameter. "These breakthroughs feed directly into our applied work to develop nanoscale sensors, and they are perfect examples of the culture of research excellence that exists among our team members," Professor Monro says. "They will enable us to study the applications of light at much smaller scales than we've ever thought possible. It will help us to better understand and probe our world in ever smaller dimensions."